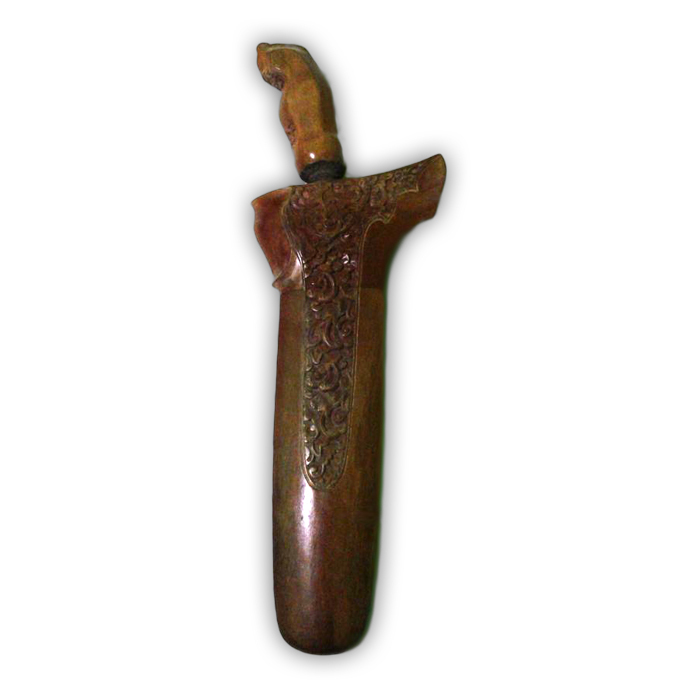 Jalak Buda is one of the earliest types of keris ever used by the indigenous people of Indonesia. This primitive dapur keris model is often referred to as the ‘keris Buda’, a general term for kerises which are made during the Buddhist era (tangguh Kabudan: 4th–9th century CE). As with all antique kerises originating from the Buddhist period in Indonesia, this keris Jalak Buda can be recognized by the distinctively short but wide and thick shape of the blade. For the rest, the Jalak Buda is especially being praised for its simple and minimalist features. Besides a plain gandik, the only other ricikan elements it features are a shallow pejetan, a double sogokan, and a tall ada-ada at the center of the blade. Moreover, the ancient iron blade does not have any pamor motif on it. 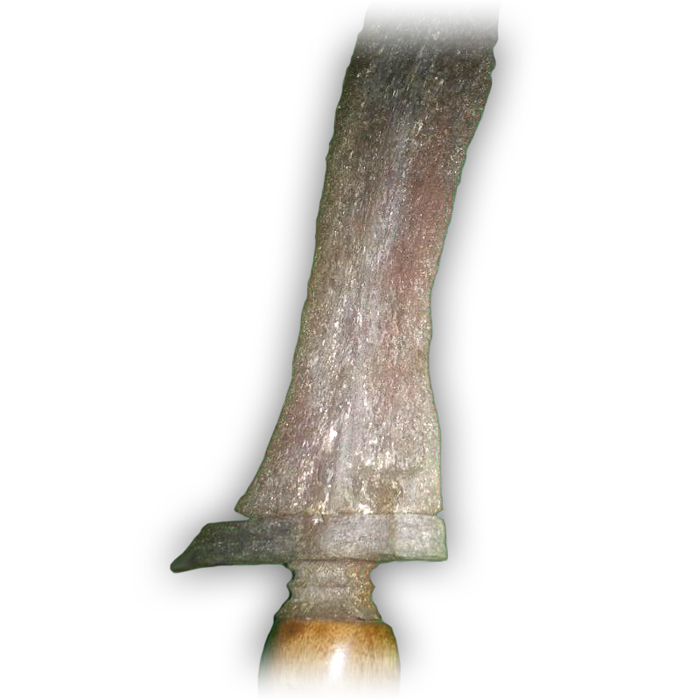 Yet a very special feature of the keris Jalak is that the part below the ganja is forged onto the base of the blade. 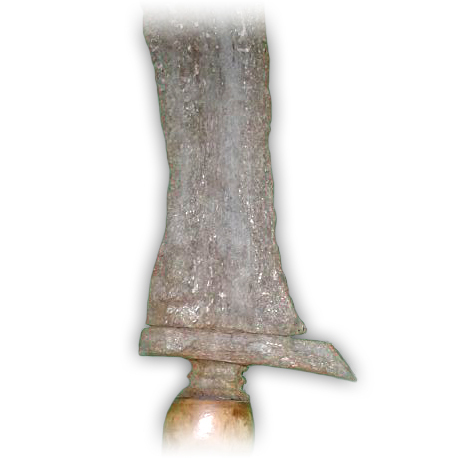 Due to this unique feature, there is no need for a selut nor mendak to be added in the space between the hilt and the blade. Kerises from the tangguh Kabudhan era believed to possess strong magical powers which help to calm the mind and encourage spiritual practice. 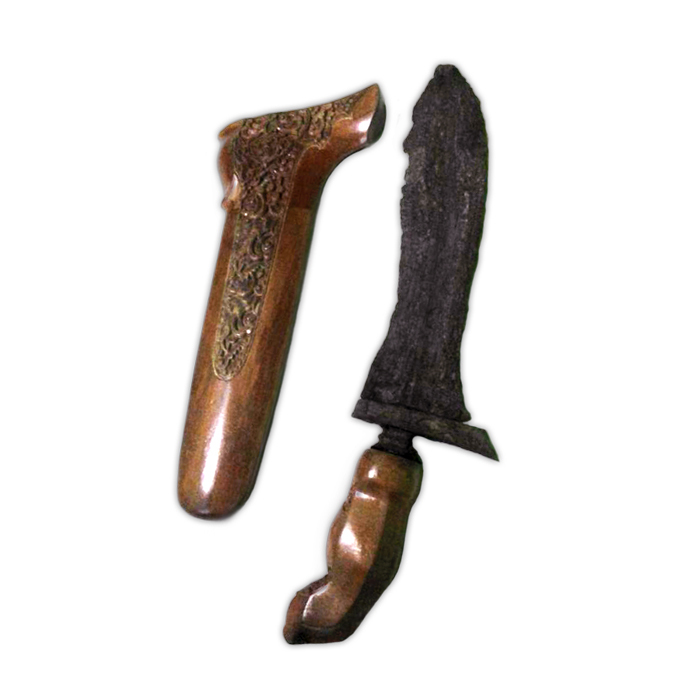 Thus, it is said that this type of keris is particularly recommended for people with an aggressive personality. 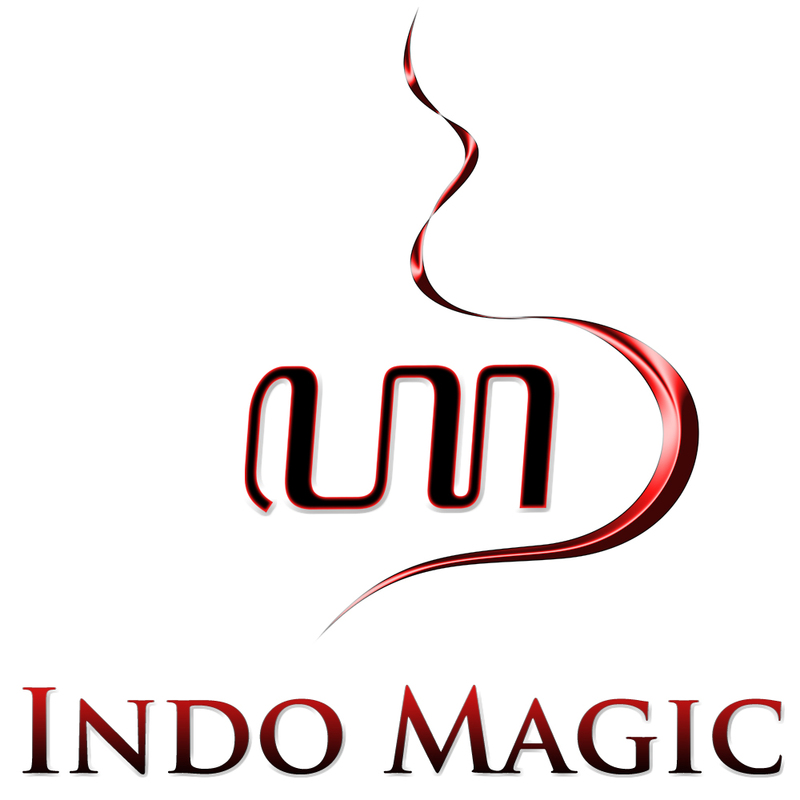 Indeed, there are specific mystical properties attributed to keris Jalak Buda which supposedly can reduce anger, rage, hostility, etc. In addition, the Jalak dapur is often also classed as a ‘keris tindhih’. 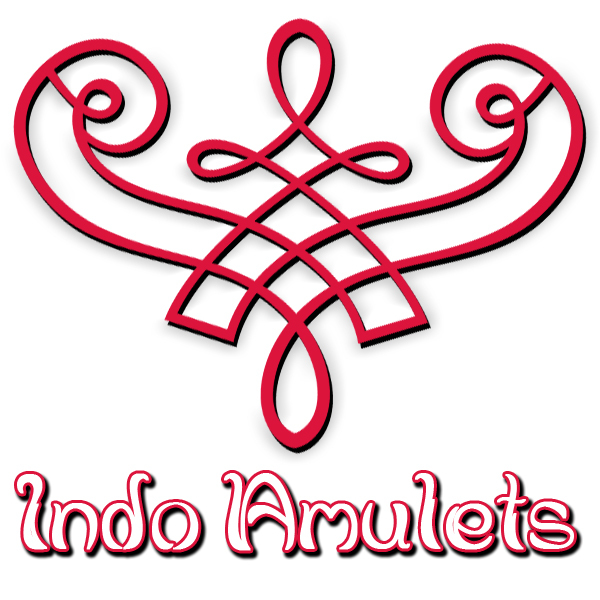 Typically a keris tindhih is used as an intermediary between pusaka items with auspicious and inauspicious qualities. Hence, as a keris tindhih, one can use the Jalak Buda to mediate between wholesome and unwholesome forces or energies stored within the blades of other pusaka items in one’s personal collection. This is done in order to neutralize any negative effects of a particular keris one may have, thereby creating a sense of balance and harmony.